Gallant technicians provide effective assessment and control of your infestation. Bees are beneficial insects and only their proximity to humans and our pets makes them undesirable and sometimes dangerous to our health and home. This is especially true of the Africanized Honey Bee, since it is extremely aggressive. 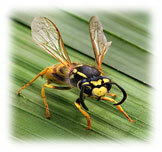 Bees and wasps are a needless danger to your family because of their painful sting. Gallant technicians provide effective control and hive removal measures.